In mathematics, a fractal is a subset of a Euclidean space for which the Hausdorff dimension strictly exceeds the topological dimension. Fractals tend to appear nearly the same at different levels, as is illustrated here in the successively small magnifications of the Mandelbrot set; Because of this, fractals are encountered ubiquitously in nature. Fractals exhibit similar patterns at increasingly small scales called self similarity, also known as expanding symmetry or unfolding symmetry; If this replication is exactly the same at every scale, as in the Menger sponge, it is called affine self-similar. Analytically, fractals are usually nowhere differentiable. An infinite fractal curve can be conceived of as winding through space differently from an ordinary line – although it is still 1-dimensional, its fractal dimension indicates that it also resembles a surface. Starting in the 17th century with notions of recursion, fractals have moved through increasingly rigorous mathematical treatment of the concept to the study of continuous but not differentiable functions in the 19th century by the seminal work of Bernard Bolzano, Bernhard Riemann, and Karl Weierstrass, and on to the coining of the word fractal in the 20th century with a subsequent burgeoning of interest in fractals and computer-based modelling in the 20th century. The term "fractal" was first used by mathematician Benoit Mandelbrot in 1975. Mandelbrot based it on the Latin frāctus, meaning "broken" or "fractured", and used it to extend the concept of theoretical fractional dimensions to geometric patterns in nature. There is some disagreement among mathematicians about how the concept of a fractal should be formally defined. Mandelbrot himself summarized it as "beautiful, damn hard, increasingly useful. That's fractals." More formally, in 1982 Mandelbrot stated that "A fractal is by definition a set for which the Hausdorff–Besicovitch dimension strictly exceeds the topological dimension." Later, seeing this as too restrictive, he simplified and expanded the definition to: "A fractal is a shape made of parts similar to the whole in some way." Still later, Mandelbrot settled on this use of the language: "...to use fractal without a pedantic definition, to use fractal dimension as a generic term applicable to all the variants". 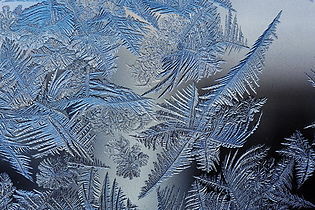 The word "fractal" often has different connotations for laymen as opposed to mathematicians, where the layman is more likely to be familiar with fractal art than the mathematical concept. The mathematical concept is difficult to define formally, even for mathematicians, but key features can be understood with little mathematical background. This idea of being detailed relates to another feature that can be understood without mathematical background: Having a fractal dimension greater than its topological dimension, for instance, refers to how a fractal scales compared to how geometric shapes are usually perceived. A regular line, for instance, is conventionally understood to be one-dimensional; if such a curve is rep-tiled into pieces each 1/3 the length of the original, there are always three equal pieces. A solid square is understood to be two-dimensional; if such a figure is rep-tiled pieces each scaled down by a factor of 1/3 in both dimensions, there are a total of 3² = 9 pieces. We see that for ordinary self-similar objects, being n-dimensional means that when it is rep-tiled into pieces each scaled down by a scale-factor of 1/r, there are a total of rn pieces. Now, consider the Koch curve. It can be rep-tiled into four sub-copies, each scaled down by a scale-factor of 1/3. So, strictly by analogy, we can consider the "dimension" of the Koch curve as being the unique real number D that satisfies 3D = 4, which by no means is an integer! This number is what mathematicians call the fractal dimension of the Koch curve. The fact that the Koch curve has a non-integer fractal dimension is what makes it a fractal. This also leads to understanding a third feature, that fractals as mathematical equations are "nowhere differentiable". In a concrete sense, this means fractals cannot be measured in traditional ways. To elaborate, in trying to find the length of a wavy non-fractal curve, one could find straight segments of some measuring tool small enough to lay end to end over the waves, where the pieces could get small enough to be considered to conform to the curve in the normal manner of measuring with a tape measure. But in measuring an infinitely "wiggly" fractal curve such as the Koch snowflake, one would never find a small enough straight segment to conform to the curve, because the jagged pattern would always re-appear, at arbitrarily small scales, essentially pulling a little more of the tape measure into the total length measured each time one attempted to fit it tighter and tighter to the curve. The result is that one must need infinite tape to perfectly cover the entire curve, i.e. the snowflake has infinite perimeter. 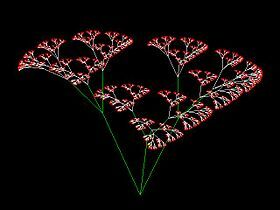 A Sierpinski gasket can be generated by a fractal tree. One often cited description that Mandelbrot published to describe geometric fractals is "a rough or fragmented geometric shape that can be split into parts, each of which is (at least approximately) a reduced-size copy of the whole"; this is generally helpful but limited. Authors disagree on the exact definition of fractal, but most usually elaborate on the basic ideas of self-similarity and the unusual relationship fractals have with the space they are embedded in. Statistical self-similarity: repeats a pattern stochastically so numerical or statistical measures are preserved across scales; e.g., randomly generated fractals like the well-known example of the coastline of Britain for which one would not expect to find a segment scaled and repeated as neatly as the repeated unit that defines fractals like the Koch snowflake. Images of fractals can be created by fractal generating programs. Because of the butterfly effect, a small change in a single variable can have an unpredictable outcome. Finite subdivision rules – use a recursive topological algorithm for refining tilings and they are similar to the process of cell division. 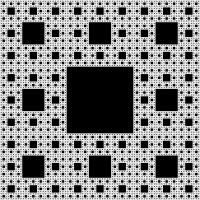 The iterative processes used in creating the Cantor set and the Sierpinski carpet are examples of finite subdivision rules, as is barycentric subdivision. When two-dimensional fractals are iterated many times, the perimeter of the fractal increases up to infinity, but the area may never exceed a certain value. A fractal in three-dimensional space is similar; such a fractal may have an infinite surface area, but never exceed a certain volume. This can be utilized to maximize the efficiency of ion propulsion when choosing electron emitter construction and material. If done correctly, the efficiency of the emission process can be maximized. ^ The original paper, Lévy, Paul (1938). "Les Courbes planes ou gauches et les surfaces composées de parties semblables au tout". Journal de l'École Polytechnique: 227–247, 249–291. , is translated in Edgar, pages 181–239. ^ The Hilbert curve map is not a homeomorphism, so it does not preserve topological dimension. The topological dimension and Hausdorff dimension of the image of the Hilbert map in R2 are both 2. Note, however, that the topological dimension of the graph of the Hilbert map (a set in R3) is 1. ^ a b c d e f g h i j k l m n o Mandelbrot, Benoît B. (1983). The fractal geometry of nature. Macmillan. ISBN 978-0-7167-1186-5. ^ a b c d e Falconer, Kenneth (2003). Fractal Geometry: Mathematical Foundations and Applications. John Wiley & Sons. xxv. ISBN 978-0-470-84862-3. ^ a b Briggs, John (1992). Fractals:The Patterns of Chaos. London: Thames and Hudson. p. 148. ISBN 978-0-500-27693-8. ^ a b c d e f g h i j Vicsek, Tamás (1992). 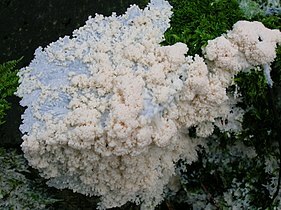 Fractal growth phenomena. Singapore/New Jersey: World Scientific. pp. 31, 139–146. ISBN 978-981-02-0668-0. ^ a b Boeing, G. (2016). "Visual Analysis of Nonlinear Dynamical Systems: Chaos, Fractals, Self-Similarity and the Limits of Prediction". Systems. 4 (4): 37. arXiv:1608.04416. doi:10.3390/systems4040037. Retrieved December 2, 2016. ^ a b c Gouyet, Jean-François (1996). Physics and fractal structures. Paris/New York: Masson Springer. ISBN 978-0-387-94153-0. ^ a b c d e Gordon, Nigel (2000). Introducing fractal geometry. Duxford: Icon. p. 71. ISBN 978-1-84046-123-7. ^ Segal, S. L. (June 1978). "Riemann's example of a continuous 'nondifferentiable' function continued". The Mathematical Intelligencer. 1 (2): 81–82. doi:10.1007/BF03023065. ^ a b c d e f g h Edgar, Gerald (2004). Classics on Fractals. Boulder, CO: Westview Press. ISBN 978-0-8133-4153-8. ^ a b c d e f g h i Trochet, Holly (2009). "A History of Fractal Geometry". MacTutor History of Mathematics. Archived from the original on February 4, 2012. ^ a b c d Albers, Donald J.; Alexanderson, Gerald L. (2008). "Benoît Mandelbrot: In his own words". Mathematical people : profiles and interviews. Wellesley, MA: AK Peters. p. 214. ISBN 978-1-56881-340-0. ^ Mandelbrot, Benoit. "24/7 Lecture on Fractals". 2006 Ig Nobel Awards. Improbable Research. ^ Mandelbrot, B. B.: The Fractal Geometry of Nature. W. H. Freeman and Company, New York (1982); p. 15. ^ Jens Feder (2013). Fractals. Springer Science & Business Media. p. 11. ISBN 978-1-4899-2124-6. ^ Gerald Edgar (2007). Measure, Topology, and Fractal Geometry. Springer Science & Business Media. p. 7. ISBN 978-0-387-74749-1. ^ a b c Peters, Edgar (1996). Chaos and order in the capital markets : a new view of cycles, prices, and market volatility. New York: Wiley. ISBN 978-0-471-13938-6. ^ Krapivsky, P. L.; Ben-Naim, E. (1994). "Multiscaling in Stochastic Fractals". Physics Letters A. 196 (3–4): 168. Bibcode:1994PhLA..196..168K. doi:10.1016/0375-9601(94)91220-3. ^ Hassan, M. K.; Rodgers, G. J. (1995). "Models of fragmentation and stochastic fractals". Physics Letters A. 208 (1–2): 95. Bibcode:1995PhLA..208...95H. doi:10.1016/0375-9601(95)00727-k.
^ Hassan, M. K.; Pavel, N. I.; Pandit, R. K.; Kurths, J. (2014). "Dyadic Cantor set and its kinetic and stochastic counterpart". Chaos, Solitons & Fractals. 60: 31–39. arXiv:1401.0249. Bibcode:2014CSF....60...31H. doi:10.1016/j.chaos.2013.12.010. ^ a b Brothers, Harlan J. (2007). "Structural Scaling in Bach's Cello Suite No. 3". Fractals. 15 (1): 89–95. doi:10.1142/S0218348X0700337X. ^ a b Tan, Can Ozan; Cohen, Michael A.; Eckberg, Dwain L.; Taylor, J. Andrew (2009). "Fractal properties of human heart period variability: Physiological and methodological implications". The Journal of Physiology. 587 (15): 3929. doi:10.1113/jphysiol.2009.169219. PMC 2746620. PMID 19528254. ^ a b Buldyrev, Sergey V.; Goldberger, Ary L.; Havlin, Shlomo; Peng, Chung-Kang; Stanley, H. Eugene (1995). "Fractals in Biology and Medicine: From DNA to the Heartbeat". In Bunde, Armin; Havlin, Shlomo (eds.). Fractals in Science. Springer. ^ a b Liu, Jing Z.; Zhang, Lu D.; Yue, Guang H. (2003). "Fractal Dimension in Human Cerebellum Measured by Magnetic Resonance Imaging". Biophysical Journal. 85 (6): 4041–4046. Bibcode:2003BpJ....85.4041L. doi:10.1016/S0006-3495(03)74817-6. PMC 1303704. PMID 14645092. ^ a b Karperien, Audrey L.; Jelinek, Herbert F.; Buchan, Alastair M. (2008). "Box-Counting Analysis of Microglia Form in Schizophrenia, Alzheimer's Disease and Affective Disorder". Fractals. 16 (2): 103. doi:10.1142/S0218348X08003880. ^ a b Hu, Shougeng; Cheng, Qiuming; Wang, Le; Xie, Shuyun (2012). "Multifractal characterization of urban residential land price in space and time". Applied Geography. 34: 161–170. doi:10.1016/j.apgeog.2011.10.016. ^ a b Karperien, Audrey; Jelinek, Herbert F.; Leandro, Jorge de Jesus Gomes; Soares, João V. B.; Cesar Jr, Roberto M.; Luckie, Alan (2008). "Automated detection of proliferative retinopathy in clinical practice". Clinical Ophthalmology (Auckland, N.Z.). 2 (1): 109–122. doi:10.2147/OPTH.S1579. PMC 2698675. PMID 19668394. ^ a b c d Losa, Gabriele A.; Nonnenmacher, Theo F. (2005). Fractals in biology and medicine. Springer. ISBN 978-3-7643-7172-2. ^ a b c Vannucchi, Paola; Leoni, Lorenzo (2007). "Structural characterization of the Costa Rica décollement: Evidence for seismically-induced fluid pulsing". Earth and Planetary Science Letters. 262 (3–4): 413. Bibcode:2007E&PSL.262..413V. doi:10.1016/j.epsl.2007.07.056. ^ a b Wallace, David Foster. "Bookworm on KCRW". Kcrw.com. Retrieved October 17, 2010. ^ a b Eglash, Ron (1999). "African Fractals: Modern Computing and Indigenous Design". New Brunswick: Rutgers University Press. Retrieved October 17, 2010. ^ a b Ostwald, Michael J., and Vaughan, Josephine (2016) The Fractal Dimension of Architecture. Birhauser, Basel. doi:10.1007/978-3-319-32426-5. ^ Stumpff, Andrew (2013). "The Law is a Fractal: The Attempt to Anticipate Everything". 44. Loyola University Chicago Law Journal: 649. SSRN 2157804. ^ Baranger, Michael. "Chaos, Complexity, and Entropy: A physics talk for non-physicists" (PDF). ^ a b Pickover, Clifford A. (2009). The Math Book: From Pythagoras to the 57th Dimension, 250 Milestones in the History of Mathematics. Sterling. p. 310. ISBN 978-1-4027-5796-9. ^ "Fractal Geometry". www-history.mcs.st-and.ac.uk. Retrieved April 11, 2017. ^ Mandelbrot, B. (1967). "How Long Is the Coast of Britain?". Science. 156 (3775): 636–638. Bibcode:1967Sci...156..636M. doi:10.1126/science.156.3775.636. PMID 17837158. ^ Batty, Michael (April 4, 1985). "Fractals – Geometry Between Dimensions". New Scientist. 105 (1450): 31. ^ Russ, John C. (1994). 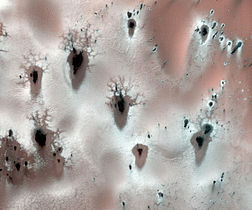 Fractal surfaces. 1. Springer. p. 1. ISBN 978-0-306-44702-0. Retrieved February 5, 2011. ^ Edgar, Gerald (2008). Measure, topology, and fractal geometry. New York: Springer-Verlag. p. 1. ISBN 978-0-387-74748-4. ^ Karperien, Audrey (2004). Defining microglial morphology: Form, Function, and Fractal Dimension. Charles Sturt University. doi:10.13140/2.1.2815.9048. ^ Spencer, John; Thomas, Michael S. C.; McClelland, James L. (2009). Toward a unified theory of development : connectionism and dynamic systems theory re-considered. Oxford/New York: Oxford University Press. ISBN 978-0-19-530059-8. ^ Frame, Angus (August 3, 1998). "Iterated Function Systems". In Pickover, Clifford A. (ed.). Chaos and fractals: a computer graphical journey : ten year compilation of advanced research. Elsevier. pp. 349–351. ISBN 978-0-444-50002-1. Retrieved February 4, 2012. ^ "Haferman Carpet". WolframAlpha. Retrieved October 18, 2012. ^ a b c d Hahn, Horst K.; Georg, Manfred; Peitgen, Heinz-Otto (2005). "Fractal aspects of three-dimensional vascular constructive optimization". In Losa, Gabriele A.; Nonnenmacher, Theo F. (eds.). Fractals in biology and medicine. Springer. pp. 55–66. ISBN 978-3-7643-7172-2. ^ J. W. Cannon, W. J. Floyd, W. R. Parry. Finite subdivision rules. Conformal Geometry and Dynamics, vol. 5 (2001), pp. 153–196. ^ J. W. Cannon, W. Floyd and W. Parry. 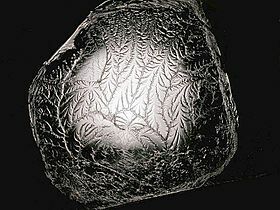 Crystal growth, biological cell growth and geometry. Pattern Formation in Biology, Vision and Dynamics, pp. 65–82. World Scientific, 2000. ISBN 981-02-3792-8, ISBN 978-981-02-3792-9. ^ Fathallah-Shaykh, Hassan M. (2011). "Fractal Dimension of the Drosophila Circadian Clock". Fractals. 19 (4): 423–430. doi:10.1142/S0218348X11005476. ^ "Hunting the Hidden Dimension". Nova. PBS. WPMB-Maryland. October 28, 2008. ^ Sadegh, Sanaz (2017). "Plasma Membrane is Compartmentalized by a Self-Similar Cortical Actin Meshwork". Physical Review X. 7 (1). doi:10.1103/PhysRevX.7.011031. PMC 5500227. PMID 28690919. ^ Carbone, Alessandra; Gromov, Mikhael; Prusinkiewicz, Przemyslaw (2000). Pattern formation in biology, vision and dynamics. World Scientific. p. 78. ISBN 978-981-02-3792-9. ^ Sornette, Didier (2004). Critical phenomena in natural sciences: chaos, fractals, selforganization, and disorder: concepts and tools. Springer. pp. 128–140. ISBN 978-3-540-40754-6. ^ Addison, Paul S. (1997). Fractals and chaos: an illustrated course. CRC Press. pp. 44–46. ISBN 978-0-7503-0400-9. Retrieved February 5, 2011. ^ Pincus, David (September 2009). "The Chaotic Life: Fractal Brains Fractal Thoughts". psychologytoday.com. ^ Enright, Matthew B.; Leitner, David M. (January 27, 2005). "Mass fractal dimension and the compactness of proteins". Physical Review E. 71 (1): 011912. Bibcode:2005PhRvE..71a1912E. doi:10.1103/PhysRevE.71.011912. PMID 15697635. ^ Takayasu, H. (1990). 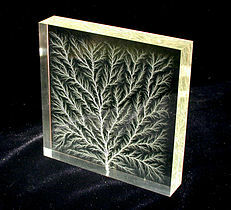 Fractals in the physical sciences. Manchester: Manchester University Press. p. 36. ISBN 9780719034343. ^ Jun, Li; Ostoja-Starzewski, Martin (April 1, 2015). "Edges of Saturn's Rings are Fractal". SpringerPlus. 4,158: 158. doi:10.1186/s40064-015-0926-6. PMC 4392038. PMID 25883885. ^ Meyer, Yves; Roques, Sylvie (1993). Progress in wavelet analysis and applications: proceedings of the International Conference "Wavelets and Applications", Toulouse, France – June 1992. Atlantica Séguier Frontières. p. 25. ISBN 978-2-86332-130-0. Retrieved February 5, 2011. ^ Ozhovan M. I., Dmitriev I. E., Batyukhnova O. G. Fractal structure of pores of clay soil. Atomic Energy, 74, 241–243 (1993). ^ Sreenivasan, K. R.; Meneveau, C. (1986). "The Fractal Facets of Turbulence". Journal of Fluid Mechanics. 173: 357–386. Bibcode:1986JFM...173..357S. doi:10.1017/S0022112086001209. ^ de Silva, C. M.; Philip, J.; Chauhan, K.; Meneveau, C.; Marusic, I. (2013). "Multiscale Geometry and Scaling of the Turbulent–Nonturbulent Interface in High Reynolds Number Boundary Layers". Phys. Rev. Lett. 111 (6039): 192–196. Bibcode:2011Sci...333..192A. doi:10.1126/science.1203223. PMID 21737736. ^ Falconer, Kenneth (2013). Fractals, A Very Short Introduction. Oxford University Press. ^ Taylor, R. P.; et al. (1999). "Fractal Analysis of Pollock's Drip Paintings". Nature. 399 (6735): 422. Bibcode:1999Natur.399..422T. doi:10.1038/20833. ^ Mureika, J. R.; Dyer, C. C.; Cupchik, G. C. (2005). "Multifractal Structure in Nonrepresentational Art". Physical Review E. 72 (4): 046101–1–15. arXiv:physics/0506063. Bibcode:2005PhRvE..72d6101M. doi:10.1103/PhysRevE.72.046101. PMID 16383462. ^ Redies, C.; Hasenstein, J.; Denzler, J. (2007). "Fractal-Like Image Statistics in Visual Art: Similarity to Natural Scenes". Spatial Vision. 21 (1): 137–148. doi:10.1163/156856807782753921. PMID 18073055. ^ Lee, S.; Olsen, S.; Gooch, B. (2007). "Simulating and Analyzing Jackson Pollock's Paintings". Journal of Mathematics and the Arts. 1 (2): 73–83. CiteSeerX 10.1.1.141.7470. doi:10.1080/17513470701451253. ^ Alvarez-Ramirez, J.; Ibarra-Valdez, C.; Rodriguez, E.; Dagdug, L. (2008). "1/f-Noise Structure in Pollock's Drip Paintings". Physica A. 387: 281–295. Bibcode:2008PhyA..387..281A. doi:10.1016/j.physa.2007.08.047. ^ Graham, D. J.; Field, D. J. (2008). "Variations in Intensity for Representative and Abstract Art, and for Art from Eastern and Western Hemispheres" (PDF). Perception. 37 (9): 1341–1352. CiteSeerX 10.1.1.193.4596. doi:10.1068/p5971. PMID 18986061. ^ Alvarez-Ramirez, J.; Echeverria, J. C.; Rodriguez, E. (2008). "Performance of a high-dimensional R/S method for Hurst exponent estimation". Physica A. 387 (26): 6452–6462. Bibcode:2008PhyA..387.6452A. doi:10.1016/j.physa.2008.08.014. ^ Coddington, J.; Elton, J.; Rockmore, D.; Wang, Y. (2008). "Multifractal Analysis and Authentication of Jackson Pollock Paintings". Proceedings of SPIE. 6810 (68100F): 1–12. Bibcode:2008SPIE.6810E..0FC. doi:10.1117/12.765015. ^ Al-Ayyoub, M.; Irfan, M. T.; Stork, D. G. (2009). "Boosting Multi-Feature Visual Texture Classifiers for the Authentification of Jackson Pollock's Drip Paintings". SPIE Proceedings on Computer Vision and Image Analysis of Art II. Computer Vision and Image Analysis of Art II. 7869 (78690H): 78690H. Bibcode:2011SPIE.7869E..0HA. doi:10.1117/12.873142. ^ Mureika, J. R.; Taylor, R. P. (2013). "The Abstract Expressionists and Les Automatistes: multi-fractal depth?". Signal Processing. 93 (3): 573. doi:10.1016/j.sigpro.2012.05.002. ^ Taylor, R. P.; et al. (2005). "Authenticating Pollock Paintings Using Fractal Geometry". Pattern Recognition Letters. 28 (6): 695–702. doi:10.1016/j.patrec.2006.08.012. ^ Jones-Smith, K.; et al. (2006). "Fractal Analysis: Revisiting Pollock's Paintings". Nature. 444 (7119): E9–10. Bibcode:2006Natur.444E...9J. doi:10.1038/nature05398. PMID 17136047. ^ Taylor, R. P.; et al. (2006). "Fractal Analysis: Revisiting Pollock's Paintings (Reply)". Nature. 444 (7119): E10–11. Bibcode:2006Natur.444E..10T. doi:10.1038/nature05399. ^ Shamar, L. (2015). "What Makes a Pollock Pollock: A Machine Vision Approach" (PDF). International Journal of Arts and Technology. 8: 1–10. CiteSeerX 10.1.1.647.365. doi:10.1504/IJART.2015.067389. ^ Taylor, R. P.; Spehar, B.; Van Donkelaar, P.; Hagerhall, C. M. (2011). "Perceptual and Physiological Responses to Jackson Pollock's Fractals". Frontiers in Human Neuroscience. 5: 1–13. doi:10.3389/fnhum.2011.00060. PMC 3124832. PMID 21734876. ^ Rulistia, Novia D. (October 6, 2015). "Application maps out nation's batik story". The Jakarta Post. Retrieved September 25, 2016. ^ Koutonin, Mawuna (18 March 2016). "Story of cities #5: Benin City, the mighty medieval capital now lost without trace". Retrieved 2 April 2018. ^ Taylor, Richard P. (2016). "Fractal Fluency: An Intimate Relationship Between the Brain and Processing of Fractal Stimuli". In Di Ieva, Antonio (ed.). The Fractal Geometry of the Brain. Springer Series in Computational Neuroscience. Springer. pp. 485–496. ISBN 978-1-4939-3995-4. ^ Taylor, Richard P. (2006). "Reduction of Physiological Stress Using Fractal Art and Architecture". Leonardo. 39 (3): 245–251. doi:10.1162/leon.2006.39.3.245. ^ For further discussion of this effect, see Taylor, Richard P.; Spehar, Branka; Donkelaar, Paul Van; Hagerhall, Caroline M. (2011). "Perceptual and Physiological Responses to Jackson Pollock's Fractals". Frontiers in Human Neuroscience. 5: 60. doi:10.3389/fnhum.2011.00060. PMC 3124832. PMID 21734876. ^ Hohlfeld, Robert G.; Cohen, Nathan (1999). "Self-similarity and the geometric requirements for frequency independence in Antennae". Fractals. 7 (1): 79–84. doi:10.1142/S0218348X99000098. ^ Reiner, Richard; Waltereit, Patrick; Benkhelifa, Fouad; Müller, Stefan; Walcher, Herbert; Wagner, Sandrine; Quay, Rüdiger; Schlechtweg, Michael; Ambacher, Oliver; Ambacher, O. (2012). "Fractal structures for low-resistance large area AlGaN/GaN power transistors". Proceedings of ISPSD: 341–344. doi:10.1109/ISPSD.2012.6229091. ISBN 978-1-4577-1596-9. ^ Chen, Yanguang (2011). "Modeling Fractal Structure of City-Size Distributions Using Correlation Functions". PLoS ONE. 6 (9): e24791. arXiv:1104.4682. Bibcode:2011PLoSO...624791C. doi:10.1371/journal.pone.0024791. PMC 3176775. PMID 21949753. ^ "Applications". Archived from the original on October 12, 2007. Retrieved October 21, 2007. ^ "Detecting 'life as we don't know it' by fractal analysis"
^ Smith, Robert F.; Mohr, David N.; Torres, Vicente E.; Offord, Kenneth P.; Melton III, L. Joseph (1989). "Renal insufficiency in community patients with mild asymptomatic microhematuria". Mayo Clinic Proceedings. 64 (4): 409–414. doi:10.1016/s0025-6196(12)65730-9. PMID 2716356. ^ Landini, Gabriel (2011). "Fractals in microscopy". Journal of Microscopy. 241 (1): 1–8. doi:10.1111/j.1365-2818.2010.03454.x. PMID 21118245. ^ Cheng, Qiuming (1997). "Multifractal Modeling and Lacunarity Analysis". Mathematical Geology. 29 (7): 919–932. doi:10.1023/A:1022355723781. ^ Burkle-Elizondo, Gerardo; Valdéz-Cepeda, Ricardo David (2006). "Fractal analysis of Mesoamerican pyramids". Nonlinear Dynamics, Psychology, and Life Sciences. 10 (1): 105–122. PMID 16393505. ^ Brown, Clifford T.; Witschey, Walter R. T.; Liebovitch, Larry S. (2005). "The Broken Past: Fractals in Archaeology". Journal of Archaeological Method and Theory. 12: 37–78. doi:10.1007/s10816-005-2396-6. ^ Saeedi, Panteha; Sorensen, Soren A. "An Algorithmic Approach to Generate After-disaster Test Fields for Search and Rescue Agents" (PDF). Proceedings of the World Congress on Engineering 2009: 93–98. ISBN 978-988-17-0125-1. ^ Bunde, A.; Havlin, S. (2009). "Fractal Geometry, A Brief Introduction to". Encyclopedia of Complexity and Systems Science. p. 3700. doi:10.1007/978-0-387-30440-3_218. ISBN 978-0-387-75888-6. ^ "description of swizzled and hybrid tiled swizzled textures". ^ "Johns Hopkins Turbulence Databases". ^ Li, Y.; Perlman, E.; Wang, M.; Yang, y.; Meneveau, C.; Burns, R.; Chen, S.; Szalay, A.; Eyink, G. (2008). "A Public Turbulence Database Cluster and Applications to Study Lagrangian Evolution of Velocity Increments in Turbulence". Journal of Turbulence. 9: N31. arXiv:0804.1703. Bibcode:2008JTurb...9...31L. doi:10.1080/14685240802376389. ^ "Introduction to Fractal Geometry". www.fractal.org. Retrieved April 11, 2017. ^ DeFelice, David (August 18, 2015). 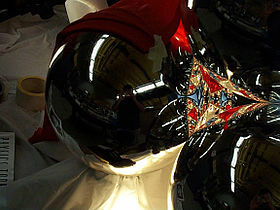 "NASA – Ion Propulsion". NASA. Retrieved April 11, 2017. Gouyet, Jean-François; Physics and Fractal Structures (Foreword by B. Mandelbrot); Masson, 1996. ISBN 2-225-85130-1, and New York: Springer-Verlag, 1996. ISBN 978-0-387-94153-0. Out-of-print. Available in PDF version at. "Physics and Fractal Structures" (in French). Jfgouyet.fr. Retrieved October 17, 2010.